Today we continue our series on ecology and conservation with a look at a particularly endangered member of the black bear family. One in ten black bears is actually born with a white coat, which is the result of a special gene that surfaces in a few . Local people have named it ‘the spirit bear'. And according to the legends of these communities, its snowy fur brings with it a special power . Because of this, it has always been highly regarded by them - so much that they do not speak of seeing it to anyone else. It is their way of protecting it when strangers visit the area. The white bear’s habitat is quite interesting. The bear’s strong relationship with the old- growth rainforest is a complex one. The white bear relies on the huge centuries-old trees in the forest in many ways. For example, the old-growth trees have extremely long roots that help prevent erosion of the soil along the banks of the many fish streams. Keeping these banks intact is important because these streams are home to salmon, which are the bear’s main food source. In return, the bear’s feeding habits nurture the forest. As the bears eat the salmon, they discard the skin and bones in great amounts on the forest floor, which provide vital nutrients. These produce lush vegetation that sustains thousands of other types of life forms, from birds to insects and more. 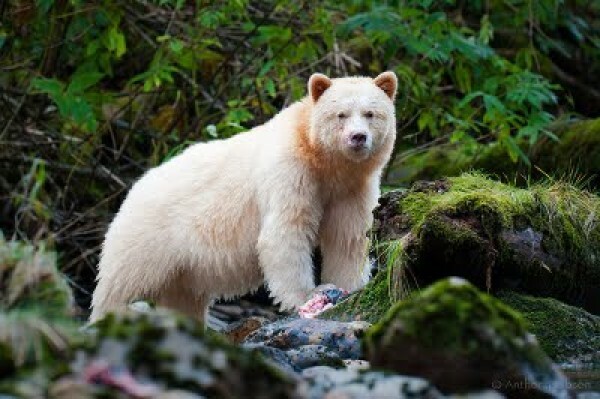 Today, the spirit bear lives off the coast of the province of British Columbia on a few islands. There is great concern for their survival since it is estimated that less than two hundred of these white bears remain. The best way to protect them is to make every effort to preserve the delicate balance of their forest environment - in other words, their ecosystem. The greatest threat to the bear’s existence is the loss of its habitat. Over many years, logging companies have stripped the land by cutting down a large number of trees. In addition, they have built roads which have fractured the areas where the bear usually feeds, and many hibernation sites have also been lost. The logging of the trees along the streams has damaged the places where the bears fish. To make matters worse, the number of salmon in those streams is declining because there is no legal limit on fishing at the moment. All these influences have a negative impact on the spirit bear’s very existence, which is made all the more fragile by the fact that reproduction among these bears has always been disappointingly low. And so, what's the situation going forward? Community organizations, environmental groups and the British Columbia government are now working together on the problem. The government is now requiring logging companies to adopt a better logging method, which is a positive step. However, these measures alone may not be sufficient to ensure a healthy population of the spirit bear in the future. • It is a white bear belonging to the black bear family. • The bear’s relationship with the forest is complex. • Tree roots stop 4 along salmon streams. • The bears’ feeding habits provide nutrients for forest vegetation. • Habitat is being lost due to deforestation and construction of 6 by logging companies. • Unrestricted 7 is affecting the salmon supply. • Interested parties are working together. • Logging companies must improve their 9 of logging. • Maintenance and 10 of the spirit bears’ territory is needed.